Welcome to Kavio’s Official Blog. - Basics to Fashion Clothing & Apparel. : Fun Fresh Tanks! Ready or not, for some Winter is making a comeback filled with rain, snow and even floods! But if you're here in the West Coast, we've been trying to chill-out on a steamy Spring warm up! 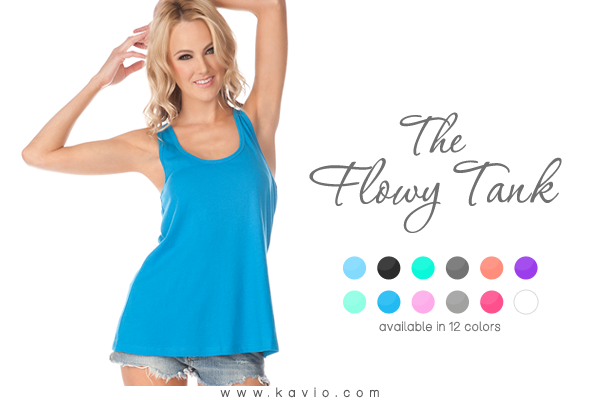 Teasing us with a little bit of Summer and considering how warm it can really get, it's a good time to update our wardrobe with NEW Summer gear with fresh tank tops in the hottest colors! Whether it's layered lacy tanks, high-lows, flowy and shoulder-bare racerbacks we've got it all. NEW for 2014: Azure, Ice Green, Flamingo and Pink Flash. with the girls on a night out, at a music festival, Spring vaycay, at the gym or just chilling by the pool we've got a lot of colors you're looking for, from classic black to fashion fresh. Effortless and classic, this tank is slightly cropped in the front with a longer hem in the back so you can layer it with a colorful bandeau, bralette or even your bikini. Dress it up with your favorite cut-off shorts and a boho cardigan for a fun Summery look. Also available for Tween Girls and Toddler Girls. With an addition to our existing basic colors, these fun, fresh, new colors (azure, ice green, flamingo, and pink flash) are just in time for Spring and Summer. With a great color palette for every mood, whether you're thinking of tranquil blue skies, clear green/blue Caribbean waters or waking up to a fresh morning sunrise to ending a day with deep pink sunsets, these tank tops will surely bring a colorful vibe to your closet.